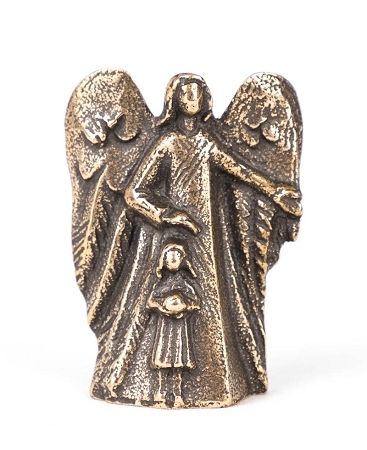 This solid bronze figurine Guardian Angel with Girl is a great gift for any parent, or a child celebrating a birthday, baptism, first communion or confirmation. Angel is Greek for “messenger”, they fly to God with our prayers, and back to us with God’s comfort. This piece was designed and forged in Germany in a monastery foundry. It is a lovely gift for those special children in your life to remind them that God’s angels–and especially their own guardian angel–watch over them constantly. Measures 2", gift boxed.